Yes, it’s muddy, snowy, and icy, but we can still have some “mini” holiday fun! Don’t you love the matchy-matchiness of our humans to equines? They got the memo! I think we’re all enjoying these warmer temps, but no one is much as our horses! They’ve been doing some “sun bathing” during their pasture time. We're looking for some part-time help around the farm! If you, or someone you know is great mechanically, and has about 15-16 hours a week, email cheryl@equi-librium.org to apply! "When someone rides a horse, they don't have a disability"
#GivingTuesday: Why today? Why Equi-librium? There are millions of charities asking you to support them on #GivingTuesday. Why should we be any different? November heralds the beginning of our “Late Fall” semester, and a bit of a slowdown on the farm. We have a more time – to take stock, to plan for the year ahead, and to reflect on how thankful we are. It is in this spirit that I write to you today; I’m hoping you’ll indulge me a few things I’m grateful for ahead of the holiday season. We have much to celebrate, but at the same time, there are challenges we face. We began the year with a fairly robust capital account, but there were a number of items we have been searching for. The first? A tractor. For two years we looked for one that met our needs AND was in our price range. Finally, a volunteer made us aware of a friend who had one meeting all our specifications and in our price range. In March, we purchased “Ol” Blue”. What a difference it has made! 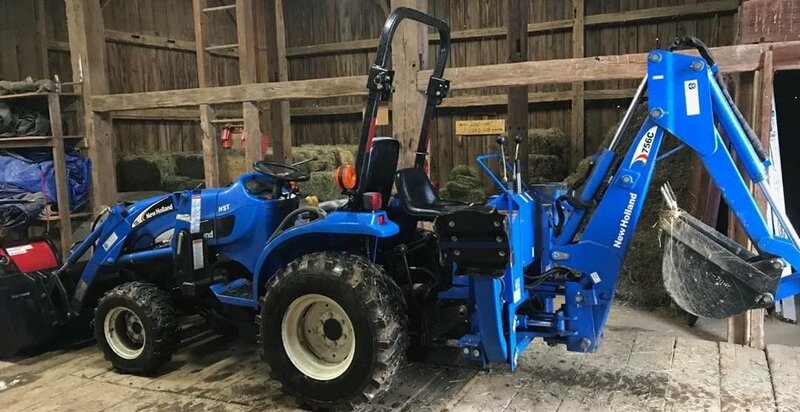 We have been able to be more efficient and no longer need to rent equipment to do certain chores around the farm. A great portion of the funds were given, and designated, for the purchase of horses. We have been dealing with an aging herd; at the end of last year we were faced with the fact that half our herd was 25 years and older. Ben, our oldest, is still in program, but is defying the odds at 36! With an average life expectancy of 25-30 years, we knew we needed to bring in some younger horses who can be trained and ready to go when the need arises. Our Equine Operations Manager spent a lot of the year looking at horses, and we welcomed 6 new “teenagers” to the farm – Buddy, Faith, Cash, Brownie, Toby, and Renny. We are still looking for two large, strong drafts or draft crosses, and will continue to look through spring. We didn’t anticipate also spending money to pave the parking lot and fix areas of the drive. Though needed, it was not in our budget. When a neighbor with a paving business stopped by to tell us he had materials left over and could help us by drastically cutting the price, we knew we had to do it! What a gift that was – saving us thousands in the process and helping to cure the ills of runoff and drainage issues affecting us and our neighbors. All prudent purchases-all needed-but not all anticipated to happen this year. We were given the gift of lumber, construction, and service from a major corporate partner- Just Born-and their vendor partner Pratt Industries. Their staffs devoted three full days to us, and in the process, built more than 400 feet of fencing and a run-in shed! We received funds from new corporate partners and were the recipient of new fundraising efforts made on our behalf by our participants’ family members. We raised the most ever this year for our Kentucky Derby party AND our Lehigh Valley Polo match! We became the first and only center like ours in the Commonwealth to be an approved provider to adults with intellectual and developmental disabilities under a Waiver program. While monumental, this gift also offers new challenges because the reimbursement rate is less than even our subsidized rate – but we know it is the right thing to do! We have seen the return of adult participants who rode as youth. One of the returning Waiver participants even remembered Ben! Talk about full circle. I am so grateful Ben is still here and was able to welcome him back, as a familiar face can be so very comforting – what a blessing! The last blessing I will share with you today comes in the form of a letter from a participant. Wins like this don’t occur every day, but they are happening more and more here at Equi-librium. The determination of our participants make them possible. Our staff and volunteers make it possible. Your support makes it possible. I am asking you today: read through this testimonial, and consider a new gift to Equi-librium to make another new win possible. I hope you’ll find it as compelling as I did. Our board members, like me, were moved to tears, and are moved every day to be involved and lead us to new heights. I hope you’ll be moved, too. I wish for you all good things as we move past Thanksgiving, and give thanks that we have wonderful, committed friends like you. When I first came to Equi-librium, 3 years ago….I was only a senior in high school. I didn’t know what I wanted, or what I was doing. I came from a place where I had lost who I was, and I didn’t really care where I was going. I knew I was hurting, but I wasn’t ready to acknowledge that, I wasn’t ready to accept myself because I wasn’t done trying to be everything I wasn’t. The truth was right in front of me, but I couldn’t see it, I didn’t want to see it. But when I got on the horse for that first lesson...I knew this pain would hold me back, and if I truly wanted to become a better rider, I needed to work through what was standing in my way. I had to find it inside of myself to take all that pain, and turn it into power. The power to persist and to fight. The power to hurt, and be scared, and broken, while still finding the courage to press onward. So I stopped trying to pretend that I didn’t have autism. I stopped trying to pretend I could feel, and I started to accept myself for everything I was and what I was dealing with. I had to learn how to set the heavy weight I was carrying down, and let it go. It was then that I realized when I wasn’t trying so hard to hide the disability that it started to get easier. It didn’t feel like I was always walking around everyone on eggshells, anymore. Somewhere inside my hurting body, I knew there was something better... something stronger, and something real. I knew my own darkness, and still...that alone didn’t stop me from finding my own light. Riding is feeling. It’s being able to learn how to be aware of the horse’s body and feel their movement underneath you. Anyone who rides will tell you it’s all about feeling, it’s about finding your seat, and it’s very hard to ride if you don’t. I can’t say I know what it’s like to be able to feel movement underneath me, but I will say that I don’t believe you have to be able to feel to ride. I know that because I can’t feel, but I’ve never let that stop me from getting on a 4 legged creature and learning how to walk, trot, or canter. I’ve never let that be the reason for giving up. Not being able to feel, is where my motivation comes from. I live there, grow there, love there. That is what moves me, to be and do better. To show this world that different doesn’t mean less. It means that I can still be whoever I want to be, regardless of what it takes to get there. That is what gives me my fire to keep going and to never stop searching for it. 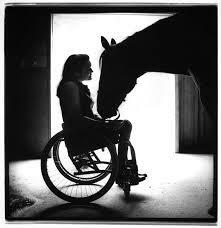 You do not need to feel to be able to get on a horse and ride. What you need is drive. I’ve proved those words wrong time and time again. So even on my weakest days, I chose perseverance. On the days I kept questioning why I was still riding because I didn’t think I was good enough. Or I was frustrated because I couldn’t feel and that’s all I wanted. I looked back at where I once was and I remembered how far I had already come. And then I chose to keep holding on because I remembered what I was really fighting for. 6 months ago, when I first started cantering again, I was really weak. I was struggling, but I refused to give in and stop trying. I knew if I wanted to get better and keep growing, I was going to have to get stronger. So I started working with a personal trainer and now I’m in that gym 6 days a week. I’ve set new goals, and I’m ready to reach them. After this last horse show, one of the judges came up to me before I left and said that I rode really well, and if I had thought about where I wanted to go from here. That was when I realized I’m ready to move on, that I am ready for this next level. My new goal, is to learn how to jump at an able-bodied barn and then start competing in horse shows. I know just where I want to get to and I will do whatever it takes to get there. Every single day, I know I am getting stronger. Even though I can’t feel it, it’s showing. I’ve learned that riding can only teach you what you choose to let it. So for me, I’ve learned to remember the goals I’ve made when I’ve been faced with setbacks, and I’ve found myself questioning why I’m still trying. To persevere and to never give up. I’ve learned that if you want something bad enough, you’re going to find the will, the determination, and the courage to do whatever it takes to make it happen. If it’s something that truly matters to you, you’re going to fight with everything you have until you get to where you want to be. And when it starts to get hard, that’s when you know it is something worth fighting for, that it matters...and you hold on just a little bit longer. Riding has taught me that when you can stop overthinking, and just let it be...that you realize it’s only that hard because you’re making it that way. It’s taught me to never forget what you’re meant to accomplish. To remember the people that love and support you. Riding has taught me that you have to choose brave: to love, to forgive, to learn, and to heal. It’s taught me that you have to be brave enough to try, to fail, to fall, and to get back up and begin again. When you make that choice, that’s when you grow. That’s where you start to make the mistakes that begin to define the places you still have to get to. That’s where you discover and grab onto your potential. That is where you hit rock bottom and find the ground which you will rise from. That’s where you stand. So if you ask me, it starts with being true, true to yourself and true to what situation you’re living with….no matter how messy and ugly it may be. And then it’s staying true to whoever is lucky enough to share those moments with you. It’s about knowing your limits...but also being willing to push past them. To say goodbye feels heavy, but it feels free. Like I can love a place with every inch of me, it can love me back….and I can still let it go. I can still wander on. Alex and the horse she rode here at Equi-librium the longest - Jackie. Looking for services? Here’s another way to find disability resources in your local community, county, and state! Like to Travel? Love Horses? Check out these deals from Go Astro Travel! For ANY trip booked with Go Astro Travel through the end of 2018, mention Equi-librium. Go Astro Travel will make a cash donation to Equi-librium, and take an additional 5% off the AMAWaterways cruise portion of the cost of the trip. For trips books with Go Astro Travel on the “Melodies of Danube River Cruise”, departing December 29. 2019, and spending New Year’s Eve in Vienna, mention Equi-librium, and you will receive another $1,000 per person savings in addition to the 5% (must be booked by end of 2018). 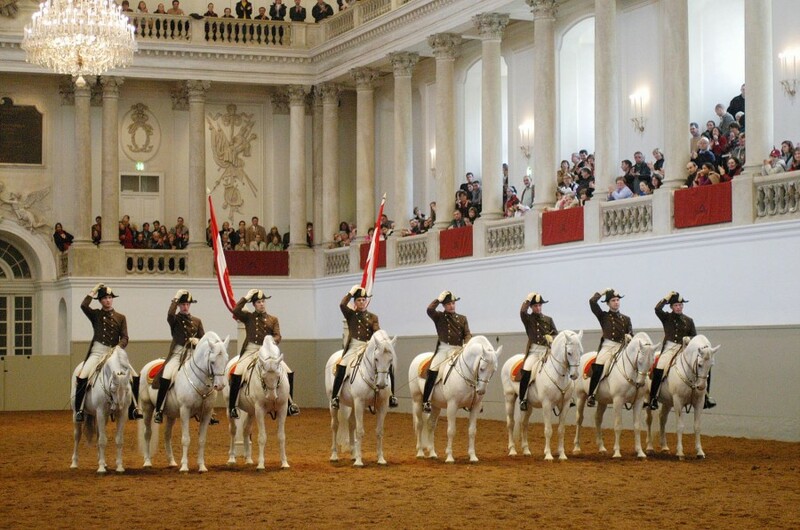 Equi-librium will again receive a cash donation, and depending on program schedules and number of bookings, Go Astro will put together an optional tour or event opportunity at the Spanish Riding School in Vienna, home of the Lippizzaner Stallions. 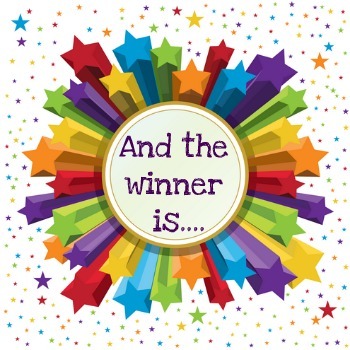 Winners of the Horse Show Sponsorship Prizes Announced! All in all, with both corporate sponsorships, donations, and funds raised by our participants, we raised just over $5,000 for our 4th Annual Participant Horse Show and Open House! They will be receiving their prizes by mail. CONGRATULATIONS and THANKS to ALL! Special shout-outs to the families who made personal donations and then notified their employers who provide matching grants! More than $500 was contributed this way! Equi-librium receives a big boost from a booster group and Moe's! We began our Monday evening board meeting with a pleasant surprise - a visit from one of our families' members. Joanne Barbera, pictured here with board chair Mark Culp, presented us with a check for $1700! The donation was made possible through the efforts of a group Joanne belongs to that does great work in the community - Beta Sigma Phi. The members of the Stroudsburg-based group reached out to their local Moe's; if you're not familiar with Moe's, they are a quick-casual restaurant serving southwest fare; if you are familiar with them, you know they are very generous to local organizations and are GREAT at hosting fundraisers. On May 16, they hosted Equi-librium night, and it just so happened that the electricity went out to quite a number of homes in that area - so many people went to Moe's that evening, and we are the lucky beneficiaries! They raised $1625.82, and then the group added their own funds to make it an even $1,700. Joanne shared with our board the story of why Equi-librium, and our work, is important to her; her granddaughter is one of our participants. Through her experience riding here with us, she has been able to rise above many of the challenges she faces. Since she joined our program she is more confident, self-assured, is on a regular schedule with her medication, and has gone from having issues in school to making honor roll every marking period! That's the kind of turn-around story we hear here a lot, but it never gets old. We are so glad that we've been able to make that kind of difference in their lives, and we are so grateful to them and their efforts to make a difference for our budget! Brandi & her sister have been living with my husband and I since 2006 (almost 3 and 1 1/2 years old). Both parents abandoned them and on top of it all Brandi has bipolar disorder. She had some very rough years, numerous hospital stays and 14 months in a residential facility. While all of this was very difficult, Brandi has made amazing progress. 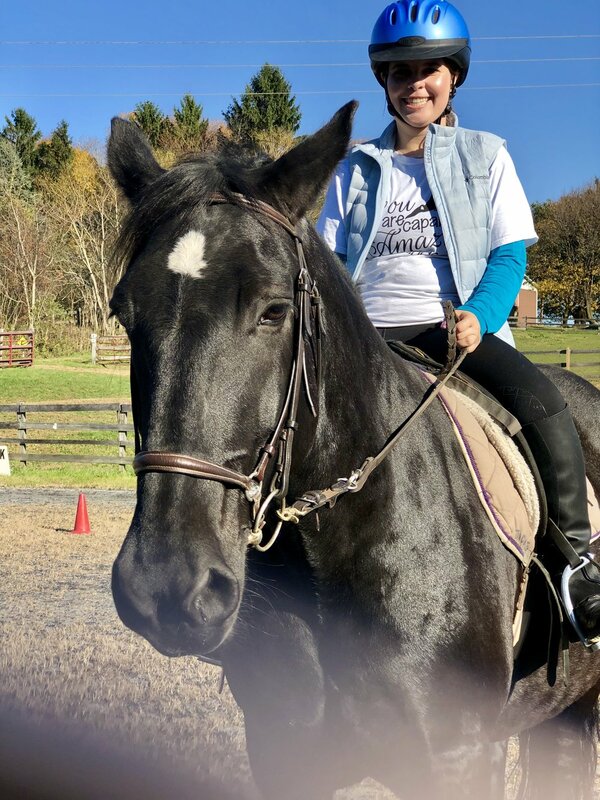 She attends regular school now and makes the honor roll, she is a very talented artist and through Equi-librium horse therapy, she absolutely loves horseback riding. She has made an incredible friend in Rylee which has also improved her socialization skills. She has decided she would like to become a veterinary technician since she loves animals and bonds with them, just ask Willie, one of her favorite horses. Thank you, for this wonderful organization, it truly has made a huge impact on our lives. This picture is from the 2017 Participant Horse Show: these are friends, family and many of the counselors that Brandi has worked with thru the years. Two of these counselors were from the residential facility near Philadelphia and a teacher she had in 2nd & 3rd grade thru the IU20 Program who tells me she is coming to Brandi's High School Graduation. Figero stands 15.2 hands and is a Quarter Horse/Belgian cross born on May 11, 2005. He is quite the character. At times he would act like the class clown and complain like a teenager before it was time to work. Once in session, he would put his game face on and was a reliable solid mount for many of our experienced and independent riders. He's been a great horse for us since 2013, but Figgy's got other plans...he would really like to be with one owner. He would be a great horse to take trail rides, to ride Western pleasure, and even to do first level dressage. He just doesn't want to have to deal with side aides and a lead rope anymore, and we want him to be happy first and foremost. He's been telling us he was unhappy in program, and even had a bout with some nervousness and anxiety, but he's in a much better place after some TLC (including ulcer prevention meds), supplements, vet, chiropractic, and acupuncture care. He's like a new horse again, and now that he's happy and feeling well, we'd love to see him go to a new forever home with an owner who can make him theirs full time! Figgy has a high play drive and is very smart, so he needs a rider with experience and the ability to keep him interested and working. We'd like to ask $2,000 for Figgy, but would be open to offers. Ah, spring! the smell of flowers in the air...WAIT! WHAT? nothing's blooming yet, you say? Well, then, it's time to fertilize! And, what better substance to use than what we have on hand in buckets (muck, that is). If you'd like some "road apples" to help your garden grow, let us know! We'll make an appointment for you to pop by and with our trusty tractor, help you "load up" on what makes fantastic fertilizer! And, if you happen to have some clean fill on your hands, we'd trade you, or just take that off your hands! Contact us to make arrangements. 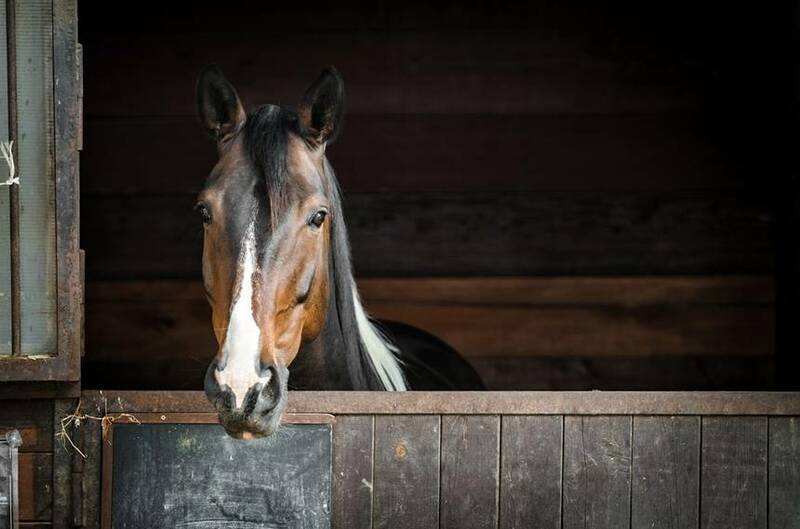 here’s good news for military vets living with post-traumatic stress disorder: New evidence suggests that therapeutic horseback riding might help calm symptoms of PTSD.